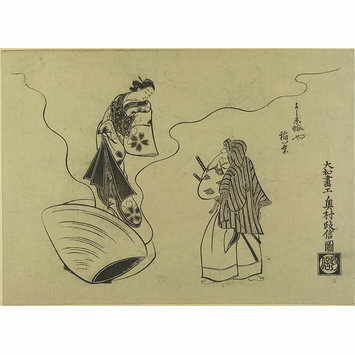 A beautiful woman emerges from a giant clam as an admirer looks on in this witty monochrome print by Okumura Masanobu. 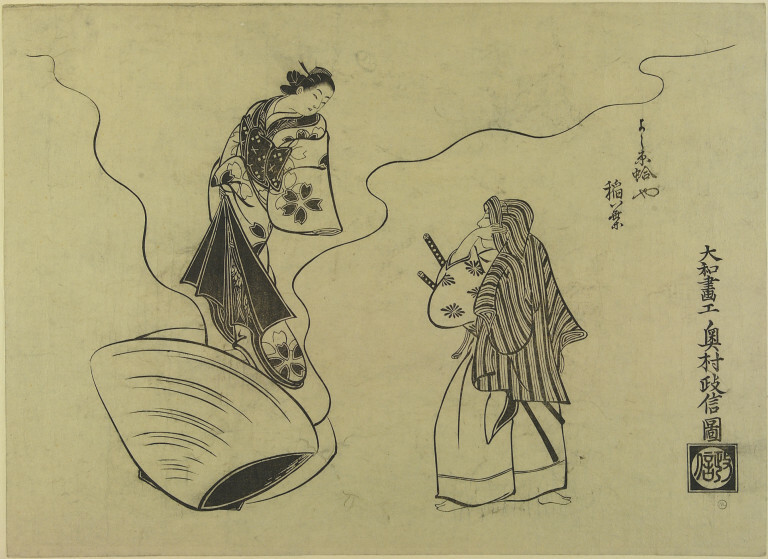 Masanobu’s contemporaries may have been able to guess her identity from the visual pun but modern viewers must rely on the inscription to the upper right of the man: she is the courtesan Inaba of the Hamaguri (‘clam’) Brothel in the Yoshiwara, the licensed prostitution district in Edo (today’s Tokyo). Masanobu was a print designer, painter and publisher of early ukiyo-e, or ‘pictures of the floating world’. His influence on the development of the genre cannot be overestimated. Among other achievements, he is credited with pioneering a craze for single-sheet portraits of famous beauties, of which this is an elegant example.